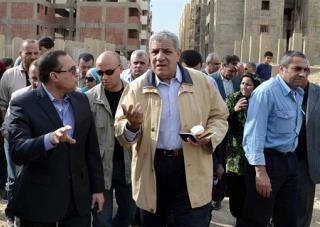 (Newser) – Egypt has a new prime minister—and he is, of all people, the housing minister. Interim president Adly Mansour today asked 65-year-old Ibrahim Mehlib, a former construction magnate and Hosni Mubarak ally, to form a government in the wake of the mass resignation of the previous government. Minutes after the official announcement, Mehlib told reporters that his cabinet members will be "holy warriors" in the service of Egyptians, fighting "day and night" to improve living standards, combat terrorism, and ensure new elections go smoothly. He says he will form his cabinet within three days. El Sissi will end up being a dictator . Imagine the outrage from homophobe GOPers if the Dems ran a candidate named "El Sissi".